The advent of a rapidly growing array of small data centers in the recent years has taken the growth prospects of global edge data center market several notches up. Analysts claim that the Internet of Things, AI, and 5G network are together driving an extraordinary surge in data production, in turn giving rise to enterprises building their own central cloud computing infrastructure to process more data at the edge. Given the vast amount of data to store, handle, and monitor, enterprises are increasingly looking for small data centers at the edge, away from the main setup and much closer to the end-use customers. Clearly, it wouldn’t be wrong to quote that with growing demand for mobility and right mix of technological advancements, the global edge data center market is currently poised to clutch some significant remuneration potential. The robust demand and economic need have further propelled the edge data center industry players to make most to the situation to their advantage. Speaking along the similar lines, it would be interesting to see how telecom, IT, technology, and software industry behemoths are actually thriving along the waves of data processing & storage to reduce network traffic, cut operating costs, analyze real-time data, and improve overall application performance. Enumerated below are few instances throwing light on various tactics adopted by the industry majors while strengthening footprints in edge data center market. Telecom industry major Bharti Airtel, recently announced that it is gearing up for a greater enterprise play through its new cloud and data center infrastructure. By providing its infrastructure to global players such as Microsoft and other app makers, Airtel is aiming to become the country’s biggest data center giant. It has been reported that as a part of its strategy, NxtraData Ltd., - the company’s wholly-owned data center unit – is likely to set up 10 new edge data centers, with four being located in Mumbai, Pune, Chennai, and Kolkata. The company is planning to bring global content to India where it can be stored in local and nearby data centers. According to reliable reports, the data center business is expecting tremendous demand from the telecom players and from over-the-top (OTT) content and high-quality video players. This has subsequently generated a clamor for data localization in the country, which in turn is favoring the growth of the regional edge data center industry share. On this note, it is also prudent to mention that IT & Telecom has emerged as a lucrative growth avenue for the global edge data center market. In the recent years, the telecom operators have started offering affordable plans, flexible offers, and 4G internet connectivity, impelling them to depend on the edge computing technologies. The advent of 5G connectivity and the demand for more secure environment for these networks is further expected to fuel edge data center market in the ensuing years. EdgeConneX, a renowned company specializing in global edge data center solutions has recently acquired Linxdatacenter facility in Warsaw, Poland. The company’s broad customer base of content, network, and cloud service providers were reportedly looking for a comprehensive solution to support its localization of data centers in Eastern & Central Europe. Analysts claim that by acquiring Linxdatacenter – an established carrier neutral data center in Warsaw, EdgeConneX will be able to meet the increasing local demand for data regulations, hybrid cloud, and storage in Poland. Analysts claim that such acquisition moves are further expected to scale the regional edge data center market to new heights. Analyzing these competitive trends, it comes as no surprise that the global edge data center industry players are actively investing in demand generating regions with favorable environmental conditions and availability of suitable resources, for deploying their edge data center infrastructures. Apart from this, several other edge data center industry players including the likes of Cisco Systems, Inc., Panduit Corp, Edgeconnex, 365 Data Centers, Rittal, and Dell, Inc., are adopting the popular tried and tested growth strategies of M&As, new product innovation & product differentiation, and R&Ds. Driven by these intense competitive trends, the global edge data center industry is further expected to tread along a lucrative roadmap in the years ahead. 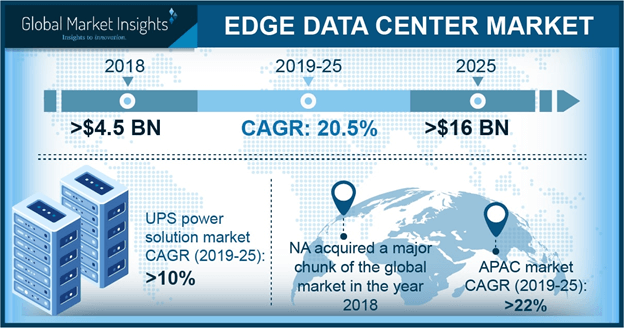 A presumption validating the same is of Global Market Insights, Inc., that forecasts the edge data center market to surpass USD 13 billion by 2024.